AbaThembu King pays tribute to mam' Winnie - SABC News - Breaking news, special reports, world, business, sport coverage of all South African current events. Africa's news leader. 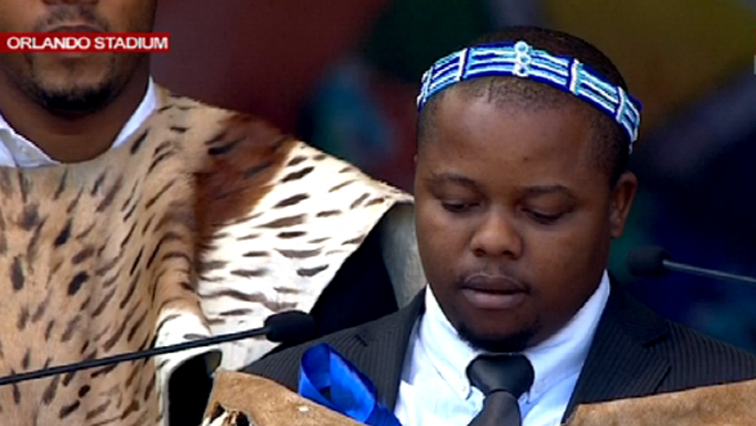 The acting Abathembu King Azenathi Dalindyebo was speaking on behalf of his father. The acting AbaThembu King Azenathi Dalindyebo has told mourners at Winnie Madikizela-Mandela’s funeral that they owe her maternal family an apology. Dalindyebo was speaking on behalf of his father, who is serving a 15 years sentence in prison for culpable homicide, assault with intent to do grievous bodily harm, arson and kidnapping. Mama Winnie’s ex-husband, former President Nelson Mandela, was from the AbaThembu royal house in the Eastern Cape. Dalindyebo says they still regard her as part of the family. “Our wish was to have her buried in the family home at Qunu, but we understand that she could not be boxed in life and in death. She is far bigger to belong to us only,” says Dalindyebo.